Two companies have been fined after a serious failure in communications led to an 80 tonne mobile crane toppling over, narrowly missing workmen and a busy road. 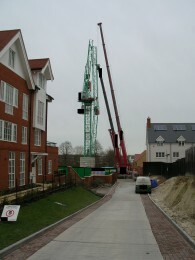 The incident happened on a building site in Fernbrook Road, Gillingham, on 18 August 2009 during construction of a new nursing home. J H Carruthers Ltd. (formerly Konecranes (UK) Ltd.) has been fined £180,000 after a worker was killed when a large steel beam fell on him at an incinerator in Slough, Berkshire. 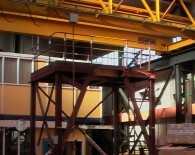 A scaffolder from Manchester will never walk again after being crushed by metal tubes which fell from a crane. UK Power Networks (which supplies the East of England, London and the South East) has been fined after an employee died while working at one of its Norfolk sites. A woman was taken to hospital and treated for multiple fractures, including two broken arms and a broken leg following the toppling of the crane she was operating.